A cart carries a block of mass m1 which is connected to a soft iron cylinder of mass m2 using an inextensible string of negligible mass passing over a light frictionless pulley as shown in the adjoining figure. The soft iron cylinder is suspended vertically with its lower end inside a current carrying coil fixed to the cart. The cylinder and the coil are coaxial and their vertical sides touch each other without any friction between them. 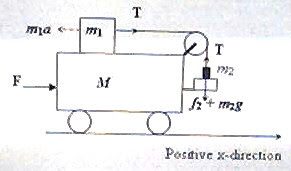 The current carrying coil exerts a magnetic force of constant magnitude f2 on the soft iron cylinder and the entire system consisting of the cart of mass M (with the current carrying coil), and the connected masses m1 and m2 are moving with a constant acceleration ‘a’ in the positive x-direction under the action of a constant force F (fig.) in the same direction. There is no friction between the cart and the block m1 and the block and the cylinder are at rest relative to the cart during the accelerated motion of the cart. Assume that g = 10 ms–2. m2g + f2 = T where T is the tension in the string. f2 = m1a – m2g = 11×(g/10) – 1×g = 0.1 g = 0.1× 10 =1 N.
(c) The magnetic force on the soft iron cylinder is always attractive (irrespective of the direction of the current) since it will become a temporary magnet in the magnetic field produced by the coil, with the nearer end of the cylinder acquiring opposite polarity (compared to the polarity of the nearer end of the coil). So the direction of the magnetic force is unchanged when the direction of the current is reversed. (d) If a permanent magnet is used instead of the soft iron cylinder, the direction of the magnetic force will be reversed on reversing the direction of the current in the coil. This is due to the fact that the magnetic polarity of the nearer end of the cylinder (permanent magnet) is fixed where as the magnetic polarity of the nearer end of the current carrying coil changes on reversing the current. (c) If the current in the coil were in the opposite direction, will the force F applied on the cart be the same or different for keeping the masses m1 and m2 at rest relative to the cart? Since the magnetic force on the soft iron cylinder is unchanged, the force F applied on the cart will be unchanged. Obviously the force F will change if a permanent magnet is used instead of the soft iron cylinder.